The Christmas feeding of the birds is prevalent in many of the provinces of Norway and Sweden: bunches of oats are placed on the roofs of houses, on trees and fences, for them to feed upon. Two or three days before cart-loads of sheaves are brought into the towns for this purpose, and both rich and poor buy, and place them everywhere. Large quantities of oats, in bundles, were on sale in Christiania, and everybody bought bunches of them. In many of the districts the farmers' wives and children were busy at that season preparing the oats for Christmas eve. "A man must be very poor indeed if he cannot spare a few coins to feed the little birds on Christmas-day!" What a pleasing picture it is to see the little creatures flying round, or perched on the thickest part of the straw and picking out the grain! It is a beautiful custom, and speaks well for the natural goodness of heart of the Scandinavian. 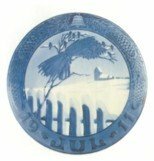 The 1911 Christmas Plate depicts the christmas sheaf. 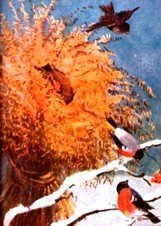 At Christmas, the last sheaf of grain saved at harvest time was raised high on a pole, a gable or on a roof as a generous offering to the birds. It was said that these feathered visitors would eat less in the barn if they had their own sheaf to enjoy. Another tradition maintained that it looked prosperous to be openhanded with the grain in this manner. But the initiated say there is a deeper significance. In the sheaf is the essence of the harvest, the vital power that makes grain grow, the spirit of fertility itself. 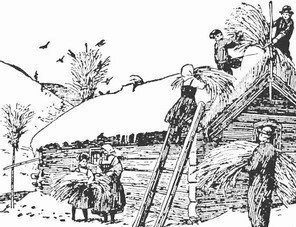 There was magic around the last sheaf gathered after the threshing was done, or the last sheaf brought in from the field. All the generating force and energy lay hidden in it, according to the old belief. Saved until Christmas it could be offered to the cattle on Christmas morning or placed outside the house to emit blessings to all who lived there and to all visitors. Naturally, the birds took advantage.